Donjon and dungeon are so obviously of the same origin that I was curious to know why the meanings are so different although both relate to feudal castles. What the French call donjon is what we call a keep in English, whereas the places where prisoners are kept is called oubliettes, from the verb oublier, to forget. No need to go into etymology there! Donjon, also written dongun, doignon and dangon in the past, is from the Gallo-Roman dominiono, attested in various forms (dunjo, dungeo, domniono, domnio, etc. ), in turn derived from the Latin dominus meaning “master”. It was used for the part of the castle reserved for the master and his family. It was well-protected against seiges and also included strategic food and weapon stocks. Prisoners who needed to be particularly guarded were also kept there. So there you go, dungeon doesn’t seem to come directly from donjon at all which is disappointing somehow! This entry was posted in Architecture, France, French language, Loire Valley châteaux and tagged donjon, dungeon, keep, oubliette. Bookmark the permalink. How interesting! I had always assumed the two words must be from the same root, but it does explain why the two words describe different parts of the building. Yes, I too was convinced that there must have been a change in meaning from one language to the other. There’s a great description of most magnificent donjon ever in Barbara Tuchman’s ‘A Distant Mirror: The Calamitous Fourteenth Century’ – a great rambling book about the Black Death and the French/English politics of the 100 Year War. 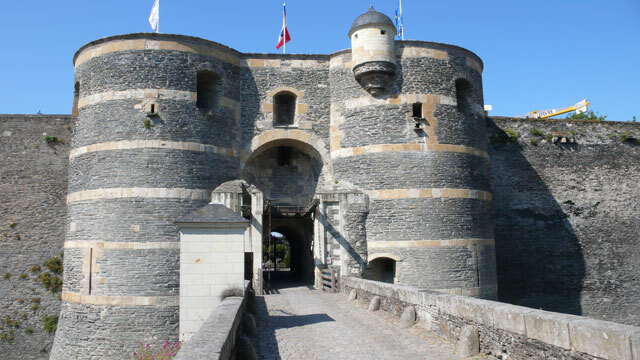 Situated in Picardy and owned by the Sire de Coucy this donjon was 180ft high and capable of housing 1000 men in a siege. Really interesting book even if it doesn’t sound like fun. One thousand men sounds like a lot during a seige. Is it still standing?